Cross-browser: The same bookmarklet can work in IE, Firefox, Opera and Safari. Click this link: instacalc bookmarklet. A calculator opens in the corner of the page. Type 1 + 1 to see the result. Select this text 15 mph in fps and click the link again. Voila! The text is automatically inserted. Neat, eh? No install, just click and go. To save the bookmarklet, right click the link and “add to favorites/bookmarks”. Now you can open the calculator on any page. Today we’ll walk through the anatomy of a bookmarklet, dissect a few, and give you the tools to build your own. Restricted length: Most URLs have a limit around 2000 characters, which limits the amount of code you can run. There’s a way around this. No spaces allowed: Some browsers choke on spaces in a URL, so yourcodelookslikethis. We have a trick for this too. Click this link to see it in action. This example isn’t too wild, but the key is that bookmarklets let you run code on an existing page. Send data to another site. Post, share, or upload the current URL or selected text (like Google translate). Look at the bookmarklet directories for more inspiration. People spend most of their time on other sites. Web application authors, think creatively: how can people use your service when away from your site? Make text url-safe: encodeURIComponent(text) (and corresponding decodeURIComponent()). The page title or URL may have invalid characters (spaces, slashes, etc.) so it’s a good habit to encode them before sending them over (spaces become %20, etc.). Once you tag and save the post, delicious sends you to the original page. How do they know where? Because it was sent along in the original request! Imagine this: Your users are browsing for cat photos (or the journals of the American Chemical Society, but probably lolcats) when they click your killer Web 2.0 bookmarklet. What happens? Take the user to a new page. Hopefully, you can use some data from the current page, otherwise it’s a regular bookmark. Frame the current page, like Google translate or Stumbleupon. This is similar to the first technique, but your site displays the old page inside the window. Overlay a new interface. Use CSS absolute positioning to make a window in a set place, or fixed positioning to have the window follow you as you scroll. Beware the CSS bugs. Overlaid windows are great, but won’t that be hard to cram into a single line? I made a trimmed-down page designed for the bookmarklet. If you click the page it appears fullscreen, but it resizes to the parent container. I planned on hosting this page inside a smaller iframe. The script to build the interface is pretty straightforward. There’s some helper functions for encoding (instacalc stores data using base64). The script gets the selected text, constructs the URL for the iframe, and loads it up. It generates the CSS to have a fixed window on the top right of the screen, and a button to hide the window. As a slight trick, if the bookmarklet is run again on the same page, it just shows the existing window instead of creating a new iframe. Make it friendly. Don’t interrupt the user’s flow. Bring up the window on the same page, or a new page that closes. If you must redirect the user to their original page. This is important: the user was nice enough to use your service, so put ‘em back where they were! Give people instructions. 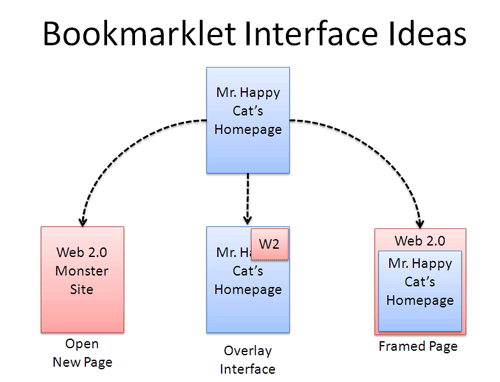 Bookmarklets aren’t that common, so help people understand your tool. A few instructions (“right click this link and add to bookmarks/favorites”) and a screenshot go a long way. Because of cross-domain security restrictions, your bookmarklets can’t use fancy-pants Ajax techniques to communicate with your site. The easiest way to communicate is through query parameters in a URL. Once the dummy page is working, try your bookmarklet on other sites. You’d be surprised how other CSS rules can mess up your carefully positioned elements (remember, you’re running in the context of another site). I’m sure you’ll come up with crazy ways to use your newfound toy. The main benefits are simple installation, compatibility, and being able to interact with the current page. People have put the delicious bookmarklet on steroids, such as letting you type the tags in the url before hitting the button. Taking this to the extreme, Greasemonkey is a firefox plugin letting you run really powerful scripts. For example, there was a script to add a “delete” button to Gmail before it was available. BetterExplained helps 450k monthly readers with friendly, insightful math lessons (more).